It is good news for 160,000 members of Nambawan Super Limited (NSL) – they can now enjoy greater discounted airfares, thanks to a joint partnership with Air Niugini. 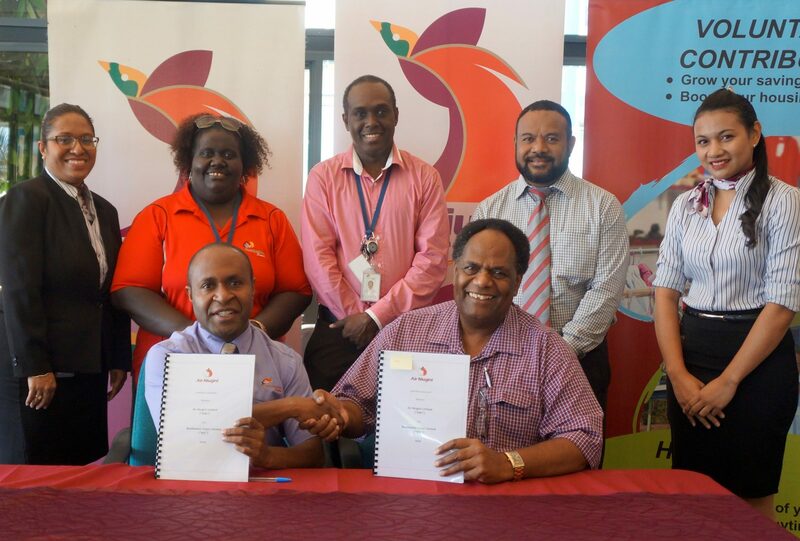 The two organizations recently signed a two year agreement from July 2016 to July 2018 which enables contributing NSL members up to a 15 percent and members of the Retirement Savings Account (RSA) , 45 percent discounted air fares on Air Niugini. Air Niugini General Manager, Customers and Markets Dominic Kaumu who was present for the signing said the discount fares apply to both ANG’s domestic and international routes and allow NSL members the chance to travel on affordable airfare fares. The discount fares are a special fare so NSL members are urged to preplan and purchase tickets in advance to take advantage of the discounts. Members intending to purchase tickets within 3 days before departure may lose out on the offer as Air Niugini has regulations and internal policies it needs to comply with including balancing loads and managing yields. Therefore, it is best that NSL members enquire about the discounts, make bookings and purchase tickets a week or more in advance of departure dates. Members seeking discounted air fares have to comply by showing their valid NSL ID cards, members’ statements listing their beneficiaries, and valid ID cards for beneficiaries such as passports, acceptable by Air Niugini to utilize the discounts. NSL’s Chief Manager Member Services, Charlie Gilichibi on behalf of Nambawan Super members acknowledge Air Niugini Board and Management for the generous discount offer. He also explained that the members’ eligibility based on their classification either under Retired Senior Citizens and Contributing Members and that the discounted airfares are based on specific fare basis, which have conditions applied. Nambawan Super will be staging member conferences to educate members on the new and revamped discount offer from Air Niugini.